Walk in and find yourself in our large kitchen with a view from the Gulf at all angles. The dining room offers seating for up to 6 people. Inside the kitchen it is fully equipped and includes a beautiful view making cooking a reward rather than a task. This recently updated unit offers a chic interior with comfortable seating and plenty of room in a gated community located directly on the beautiful Gulf of Mexico. This beautiful 12th floor condominium is ocean-front and is a great place to bring your family for fantastic vacation. Grocery store, shopping and entertainment for kids close by. Fully-equipped kitchen, built-in dishwasher, washer & dryer all included. Welcome to Paradise imagine relaxing in our spectacular gulf front condominium. Sit back and relax on the spacious balcony which overlooks the most amazing turquoise waters you have ever seen. Listen carefully. Can you hear the waves crash upon shore. Soak up the sun during the day then return to the beautifully decorated, upscale 2 bedrooms, 2 bath 15th floor condominium. Pamper up to 8 guests at a time. Create special memories that will keep you coming back year after year. 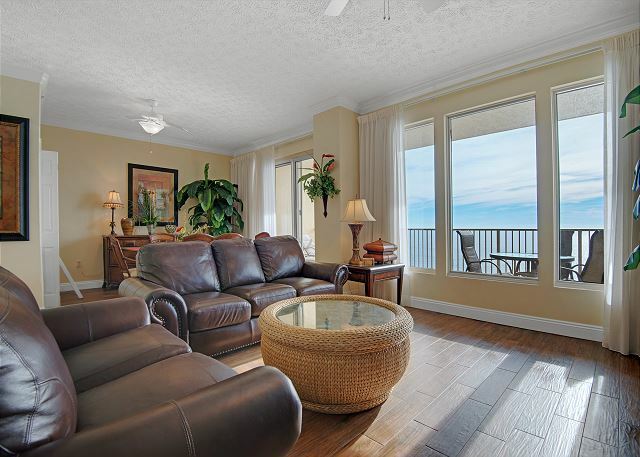 This modern 16th floor condo has breathtaking views of emerald waters and white sandy beaches of Panama City Beach. If you listen closely you'll even hear the waves crashing upon the shore line. This stunning 16th floor condominium is in a gated community and in a great location. Looking for a fabolus family vacation. This should be your destination. This unit is fully furnished and located directly on the Gulf of Mexico. Best you will find in Panama city! It's kept clean and it's in a nice area and conveniently located condo is nicely equipped and can sleep 8 people comfortably. Amenities include 2 pools, 2 jacuzzi's, a game room, gym and a tiki bar. ***Includes Beach Chairs with Umbrella***Vacation rental condominium. Sleeps 6, 2 bedrooms, 2 bathrooms. No pets allowed.